Check out this awesome mockup by Placeit! It features a window decal on the back left door of a white car, it's an excellent option for you to showcase your design or logo in a professional and creative way. Start by dragging and dropping your image file on the interface, it'll be processed in just seconds. Placeit has a lot of different kinds of mockups for you to display awesome designs in different ways. Try more Window Decal Mockups here! 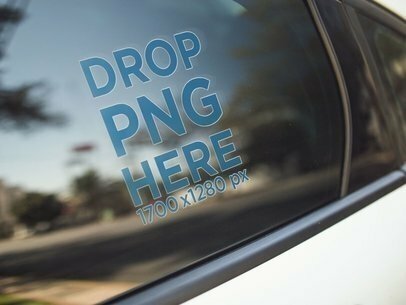 Check out this awesome mockup featuring a small square decal on the back window of a car, it's a gorgeous visual that you can use to promote your logo in a beautiful and professional way. You just have to drag n' drop your design image file over the interface, we will merge it for you in just seconds. Use Placeit now and make your income grow! Try another Window Decal Mockup here! Start promoting your business the smart way with Placeit's beautiful window decals! This one features a gorgeous window decal between two wooden structures right in front of the window. All you have to do is drag-and-drop your image file on the interface, it'll be processed in just seconds. Start now and make your customers love you! Try another Print Mockup here! 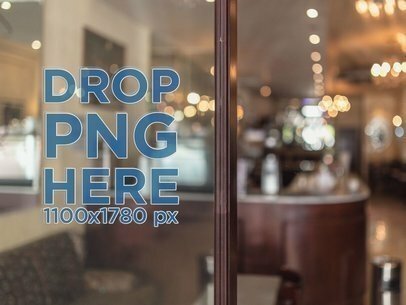 Check out this awesome mockup featuring a window decal on a blurry glass, it's the perfect choice if you are trying to promote your business, logo or design in a creative and beautiful way. Start now! All you have to do is drag-and-drop your image file on the interface, we will process it in just seconds. Try another Window Decal Mockup here! 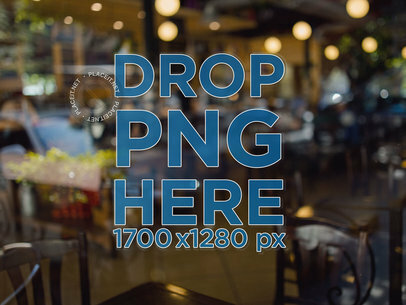 If you want to print a vinyl decal or any other kind of decal to place on the windows or storefront of a coffeeshop, try out this window decal mockup! 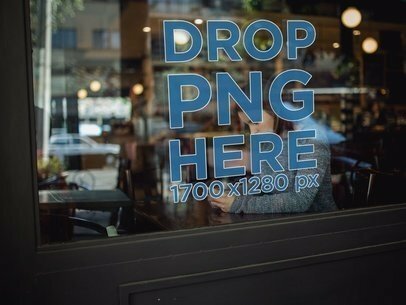 You can generate a photorealistic photo of your design beautifully placed at a coffee shop window, to try out your decal before printing! 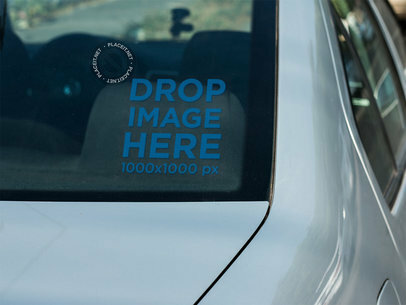 Try another Window Decal Mockup here! Start promoting your latest logo using Placeit! 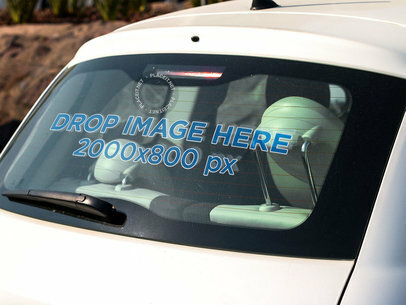 This mockup features a square window decal, it's on the back window of a white sedan. All you have to do here is drag-and-drop your jpeg or png image file over the interface, we will merge it for you in just seconds. Amazing, right? Start now and make your income grow! Try another Window Decal Mockup here! Start showcasing your latest logo with Placeit! 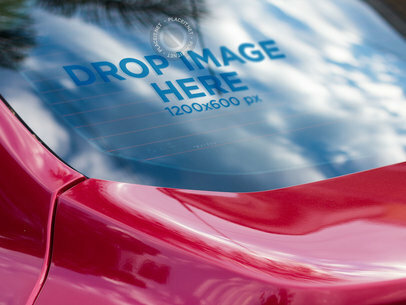 This mockup features a red car with a window decal on the back window reflecting clouds. 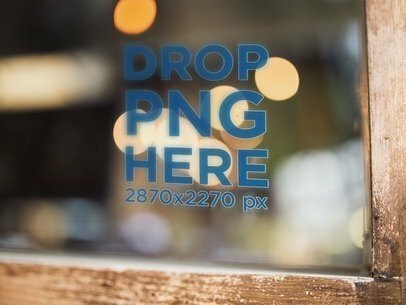 This image is a beautiful choice for you to promote your logo in a more professional and gorgeous way. Just drag-and-drop a jpeg or png image file on the interface, we will merge it for you in just seconds. Try another Window Decal Mockup here! Check out this awesome mockup of a horizontal window decal while a young hispanic woman is focused writing a text message on her phone on the other side of the window. 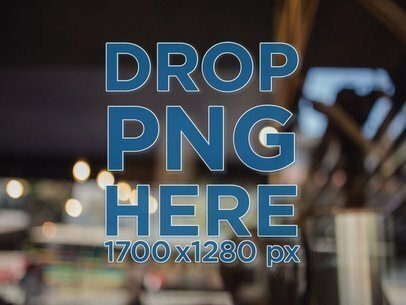 Start now showcasing your awesome store with this mockup, just drag-and-drop your image file on the interface so we can process it in just seconds. Placeit has tons of beautiful visual assets that will help you build a better image marketing. Try another Window Decal Mockup here! Start promoting your awesome designs using Placeit's mockups! Start now, this one features a decal on a window door near the handle, it's a great option to showcase your awesome design, logo or business name. All you need to do is drag-and-drop your image file on the interface, we will process it in just seconds. Try another Window Decal Mockup here! Check out this awesome mockup of a square decal on the back window of a white car, it's an awesome choice if you are looking to promote your latest ideas in a beautiful and professional way, this window is reflecting the clouds as well! All you have to do is just drag n' drop your design image file on the interface, we will merge it for you in just seconds. Awesome, right? Start now and make your income grow! Try another Window Decal Mockup here! 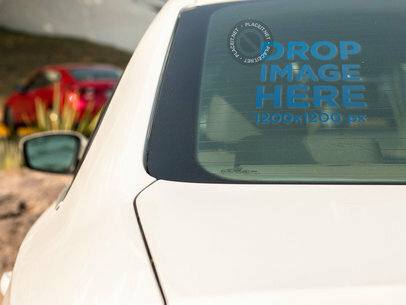 Take a look at this awesome mockup featuring a decal on the back window of a blue car, it's a gorgeous visual that you can use to promote your latest logo in a professional and visually appealing way! All you have to do is drag-and-drop a jpeg or png image on the interface, we will merge it for you in just seconds. Start using Placeit and make your income grow! Try another Window Decal Mockup here! Take a look at this awesome template featuring the back window decal of a white car, it's a really cool visual that you can use to promote your latest design in a beautiful way. 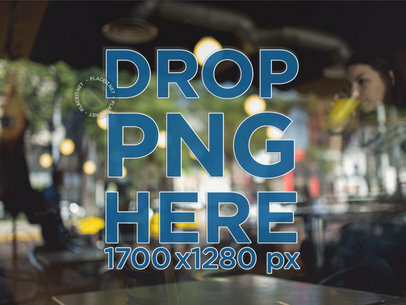 All you have to do is drag n' drop a jpeg or png image file over the interface. We will merge it for you in just seconds. Start using Placeit now and make your revenue grow! Try another Window Decal Mockup here! 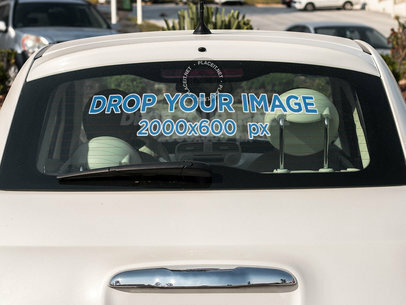 Take a look at this awesome mockup featuring a window decal in the back window of a white Fiat. It's a really cool visual that you can use to promote your latest design in a creative and beautiful way. 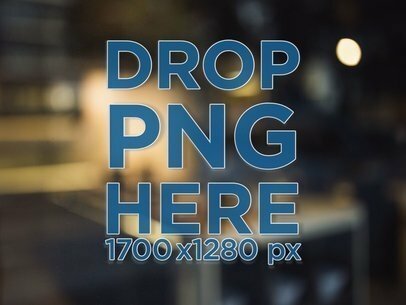 All you have to do is drag-and-drop your image design on the interface, after a couple of seconds you will see it processed on your screen. Awesome, right? Try another Window Decal Mockup here! 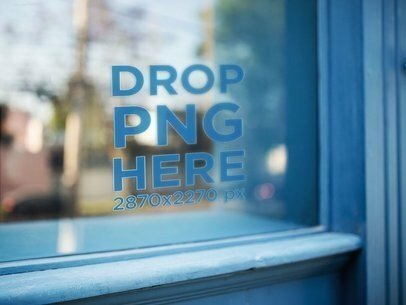 Start promoting your brand, business or logo with this awesome mockup of a decal near the corner of a window, it's surrounded by a wooden blue frame. It's awesome! All you have to do is drag-and-drop your image design file on the interface, we will process it in just seconds. Placeit has a lot of different templates for you to display your designs the smart way. Try another Window Decal Mockup here! Start using Placeit's visual assets and make your business grow! 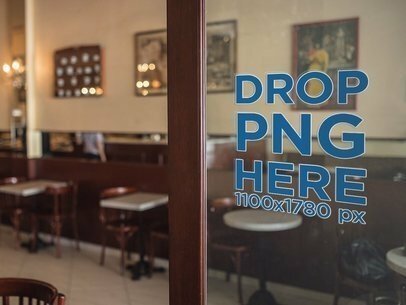 This mockup features a door window decal inside a beautiful and very classy coffee shop, it's an excellent option for you to start displaying your logo, design or business name. 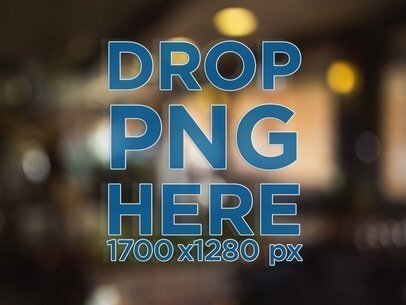 Drag-and-drop your image file over this interface to have it merged with the window decal, after a few seconds you'll see it in your screen. Great, isn't it? Try another Window Decal Mockup here! 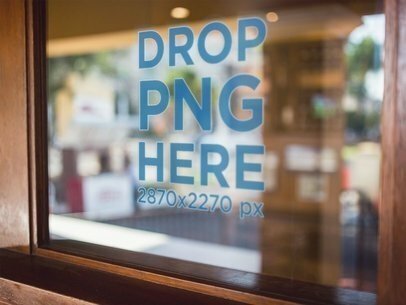 This window decal mockup is an excellent option for you to start displaying your most awesome designs, logos or business! 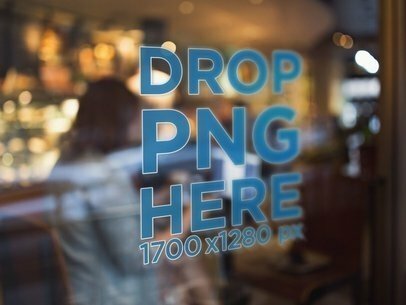 All you have to do to get started is drag-and-drop your image file on the interface, we will merge it for you in just seconds with this window decal. Placeit has a lot of different options for you to start promoting your business the smart way! Try more Window Decal Mockups here! 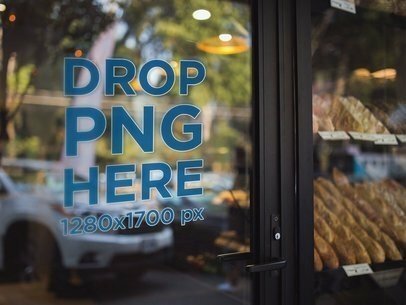 Showcase your new coffee shop logo with this awesome mockup of a decal on an angled coffee shop window, it's a great choice for you to promote your business! 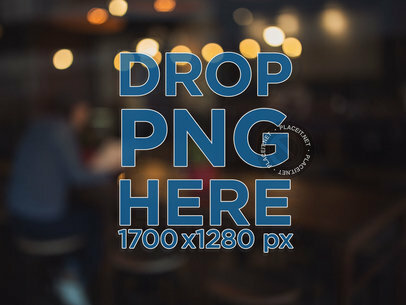 All you have to do is drag and drop your image jpeg or png on the interface, we will merge it for you in just seconds. That's all you have to do, what are you waiting for? Try another Window Decal Mockup here! 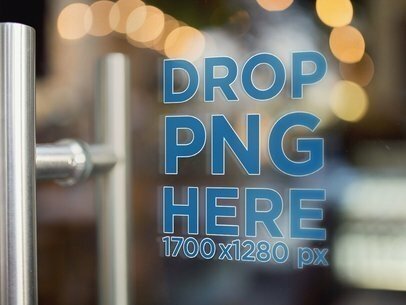 Start promoting your logo, design or business with this beautiful mockup of a decal on a blurred window by Placeit! Start now, all you have to do is drag and drop your image file on the interface, it'll be processed in just seconds. That's right, that's all the work you have to do. Isn't Placeit amazing? Try a lot of different templates and make your business grow! Try another Window Decal Mockup here! 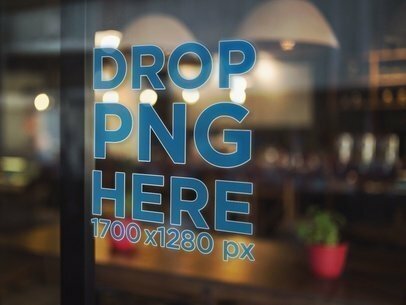 Have a look at this awesome mockup of two window decals above a wooden wall, it's a great option for you to start promoting your business. Start now showcasing your logo or design with this template from Placeit, all you need to do is drag-and-drop your image file on the interface, we will process it for you in just seconds. Try another Window Decal Mockup here! 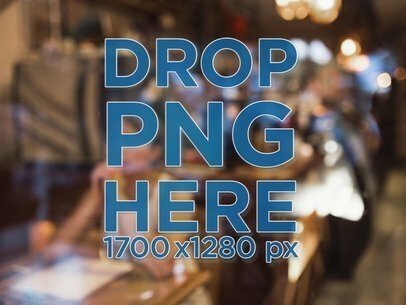 Check out this awesome mockup of a window decal on a blurred pane of glass. Start now and make your income grow with Placeit! All you have to do is drag-and-drop your image file on the interface, we will process it for you in just seconds. Placeit has a lot of different kinds of mockups for you to improve your image marketing. Try another Window Decal Mockup here! Start showcasing your awesome designs with Placeit's beautiful visual assets! This angled template features a window decal surrounded by a brown wooden frame, it's a great option for you to showcase your design, logo or business name. Start now, you just have to drag-and-drop your image file on the interface, it'll be processed in just seconds. Try another Window Decal Mockup here! Start promoting your business the right way, use Placeit! All you have to do is drag-and-drop a jpeg or png file on the interface, we will merge it for you in just seconds. Start now and make your income grow! 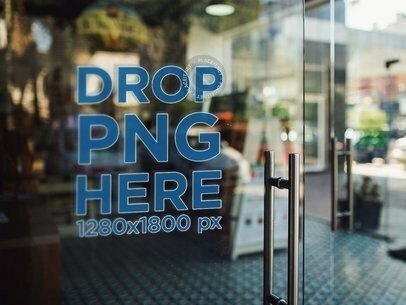 This mockup features a decal in a window door alongside the metal handle. Start using photorealistic images and show your customers how your designs look like in real life! Try another Window Decal Mockup here! 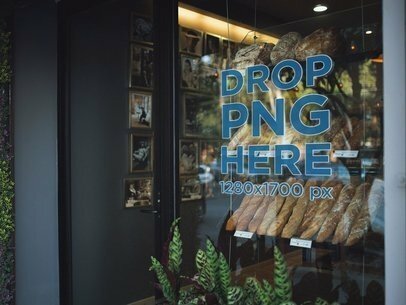 Check out this awesome mockup of a window decal in an angled view, it's in the glass door of a bakery store, and it will help you improve your sales! You just need to drag-and-drop your image file on the interface so it can be processed in just seconds. Market your business the smart way with Placeit's visual assets. Try another Window Decal Mockup here! 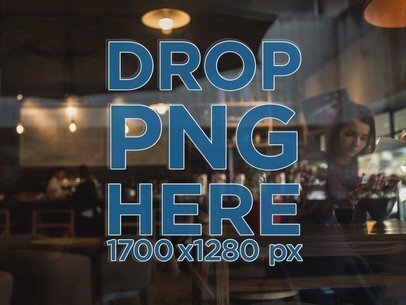 Start promoting your business with this awesome mockup of a store with girls chatting and a window decal in the front, it's a really beautiful and professional visual asset that will help your image marketing improve! Start now, all you have to do to merge your design or logo with it is drag-and-drop a jpeg or png file on the interface. Make more money with Placeit! Try another Window Decal Mockup here! 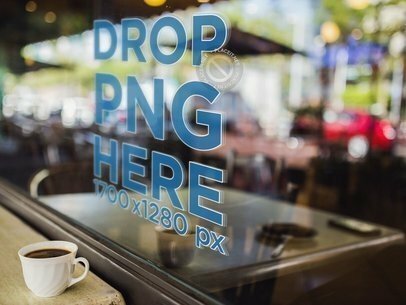 Check out this awesome mockup of a window decal in a store's window, it has a table with a cup of coffee alongside it, and it's awesome! All you have to do is drag n' drop your image file on the interface, it'll be processed in just seconds. Start now and make your income grow! Try another Window Decal Mockup here! Check out this awesome mockup of an angled window decal with a wooden table and red pots in the background, it's awesome! All you have to do is drag-and-drop your image file on the interface, we will process it for you in just seconds. Start now making your business grow with Placeit's beautiful templates. Try another Window Decal Mockup here! Check out this awesome mockup featuring a window decal, a girl reading and a red pot behind it, it's a great option if you are trying to make your income grow. Start now! All you have to do is drag-and-drop an image file on the interface, it'll be processed in just seconds. Try another Window Decal Mockup here! 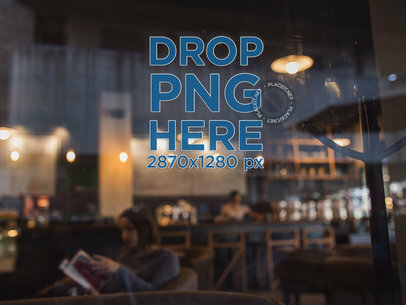 Start using this mockup of a decal in the front window of a coffee shop and start making your revenue grow with Placeit! All you need to do is drag n' drop your image file on the interface, it'll be processed in just seconds. Placeit has a lot of different kind of templates for you to make your business grow. Try another Window Decal Mockup here! 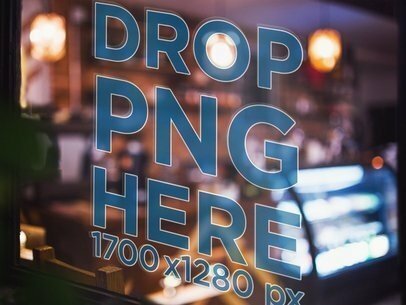 Try out this window decal mockup to try out the design you want to put up on your restaurant's windows. You can use a solid color or a multicolor image, or even a photograph. The realistic effect on this window decal will help you visualize what your design will look like in real life. 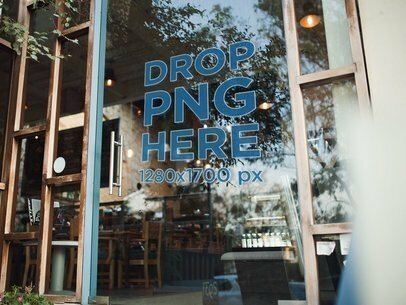 Try another Window Decal Mockup here, or create your own design with our Restaurant Logo Maker! If you're a graphic designer or even a small business owner, you've found yourself needing to create vinyl decals or cutout decals to place on a window. 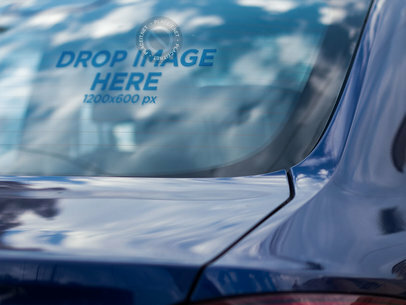 The easiest way to visualize what they would look like is trying out this photorealistic window decal mockup! Upload your image and it will be ready in seconds. Try more Window Decal Mockups here! 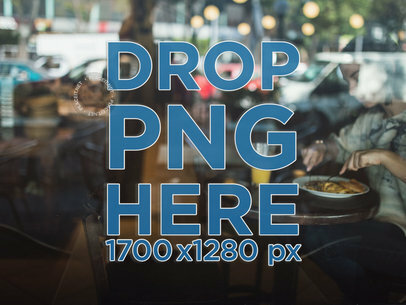 This photorealistic window decal mockup features a glossy window on a sunny day with a girl eating inside a nice breakfast place. You can show your cutout decal or vinyl decal in this mockup to visualize what it would look in real life! Try another Window Decal Mockup here! 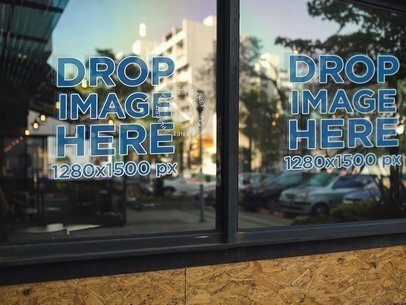 This cutout vinyl mockup on a window will let you preview your designs in a realistic way. You can see how it would look like once it's printed and mounted on a window. Try it out now! Try another Window Decal Mockup here!